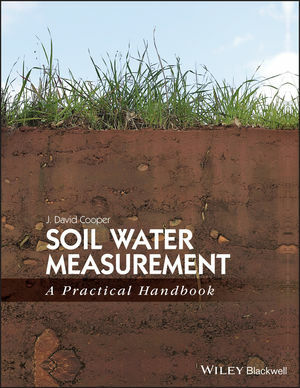 This book is written for all those involved in measurement of soil water phenomena, whether they be environmental scientists, field technicians, agronomists, meteorologists, hydrogeologists, foresters, physical geographers, civil or water engineers or students in these subjects. It contains a comprehensive description of all the major methods used for measurement of soil water content and potential, solute concentration, transport and balance of water and solutes, including recharge to groundwater aquifers. The emphasis is firmly on techniques which can be applied in the field or on samples obtained from the field. The theory and practice of the workings of the main instruments and methods available is described, along with practical tips on surmounting some of the main difficulties and explanations of many commonly encountered jargon words. David Cooper graduated in Physics from Imperial College, London. He spent 23 years as a soil physicist with the UK Institute of Hydrology, later the Centre for Ecology & Hydrology (CEH), followed by 12 years as Head of the Hydrological Instruments Group at CEH. His work has focussed mainly on field measurement of soil water and solute fluxes and of soil hydraulic properties in a wide variety of lithologies and areas of the world, including at several sites in southern England, northern France, Kenya, Niger, Mauritius, India and China. He has contributed to advances in measurement of soil water content by neutron, capacitance and time domain reflectometry techniques, hydraulic properties measurement methods in situ in the field and soil water potential measurement using mercury manometer and pressure transducer tensiometers over extended periods at both shallow and deep depths, down to at least 60 metres. He has six children and, at the time of writing, nine grandchildren.